Using a rowing machine is one of the most effective, if often underrated, ways to get your body fit and strong. Rowing works out the entire body and is great for building and toning your muscles. It can be a substitute for other well-known exercises like running because it is a low-impact but high-intensity activity with no harsh impact like running which helps save your knees. It is particularly suitable for older fitness enthusiasts. 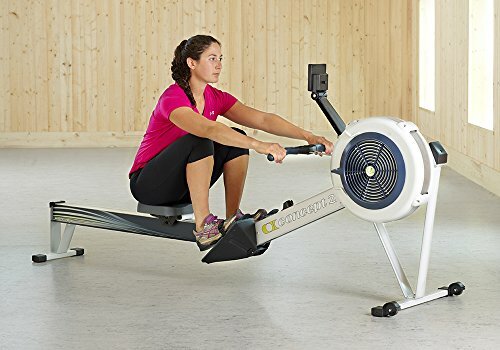 If you are looking to try rowing as a workout but don’t have the opportunity to do the actual outdoor activity, you can still perform it indoors with the use of a rowing machine. An indoor rowing machine also called an ergometer (“erg” or “ergo” for short), is a machine used to simulate the action of water rowing for training purposes. It measures the amount of work performed by measuring the amount of energy you generate as you operate the equipment. Air resistance, or flywheel, offers a similar feel to outdoor rowing, as the resistance is generated by the wind. This machine uses fan blades attached to the flywheel, creating resistance when a user performs the pulling/rowing motion. You can increase resistance by pulling harder because you move the flywheel faster and create stronger wind currents. 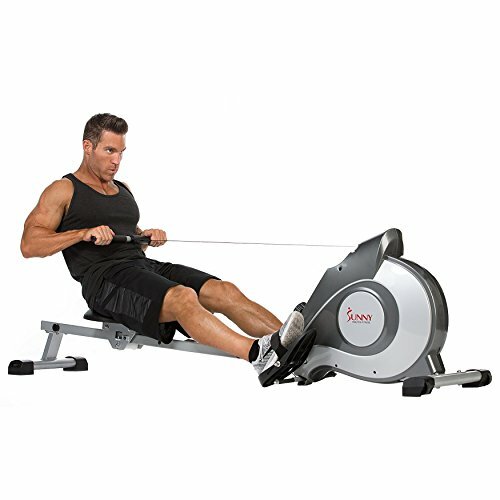 This type of rowing machine utilizes a mechanical magnetic brake system that produces a steady, rowing motion. Magnetic resistance machines don’t produce any friction, unlike air resistance, which enables the user to have a smooth and virtually soundless workout. The only disadvantage with a magnetic rowing machine is that it’s too smooth. The resistance is constant, so it doesn’t really simulate actual rowing conditions where the resistance increases the harder the user pulls the handle. A water resistance machine consists of a paddle revolving within a tank filled with water. The drag from the moving water creates resistance, as the user pulls the flywheel mechanism. Because water generates the resistance, this is the closest to outdoor rowing. What Muscles Are Engaged During Rowing? Rowing may look easy, but don’t be fooled. The rowing stroke is quite complex, and can even take years to really master! The catch is the start of the rowing motion. Here, you are at full compression leaning forward, absorbing the resistance weight. The drive shows the sequence of rowing motion—legs first, then your back, and lastly, the arms. Hold a strong body angle first when pushing the legs down. A common mistake that beginners make is pulling with the arms first or opening up with the shoulders before driving the legs down. Not only does this strain the shoulders, it also fails to work the lower body. Like the term says, this is the end of the motion. Check your position after the rowing sequence: you should be sitting with your legs flat, shoulders and elbows bent close to the hips and the machine handle drawn taut towards the body, specifically at the lower ribs. Rowing is a total body workout that targets every major muscle group. The catch position involves your back muscles, quads, hamstrings, and calf muscles. As you go into the drive, your abs, triceps, chest and shoulder muscles, and glutes are activated. Finally, the finish keeps your biceps and obliques stimulated. 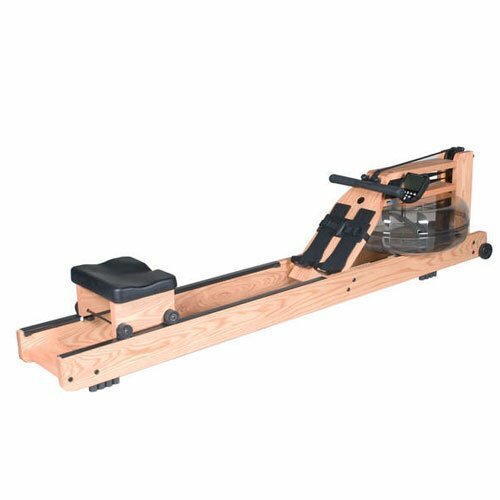 If you’ve just started rowing and want a simple and reliable rowing machine at home, the Concept 2 Model D Indoor Rowing Machine is for you. This is an air resistance model designed to provide a smooth, silent row every time. With its flywheel mechanism, you can achieve an ideal rowing workout according to your pulling strength. Moreover, its ergonomic design allows the optimal arm and hand positioning for a safe exercise session every time. The Concept 2 Rowing Machine has a 14-inch elevation for the seat, connected to a chain that provides a secure workout. Thanks to the easy-grip handle and flexible footrests, you can maintain balance and stability without sacrificing your comfort. The air resistance mechanism is solid, with fan blades engineered to create minimal noise. The flywheel and spiral damper allow for adjustable tension. Users can also enjoy its high-tech PM5 Performance Monitor, which keeps you updated with all the information and stats as you progress through your workout. Data like Strokes Per Minute (SPM), Distance Covered, Calories Burned, Pulse Meter, and Heart Rate are recorded. You can connect the PM5 to your computer and access the data from the LogCard as well. This monitor feature enables you to determine whether you’re reaching your fitness goals or if you need to challenge yourself more. The Concept 2 Rowing Machine is adjustable according to a user’s height. It is 24 inches high, 96 inches long, and 14 inches wide. The long rowing range means that it’s usable whatever your height. The Concept 2 Model D machine features durable construction that delivers performance while simultaneously offering a compact workout. Whatever the intensity, this machine produces minimal sound, so you can enjoy a full workout without worrying too much about the noise. Concept2 is a company based in Vermont, US. They are one of the leading manufacturers of rowing equipment around the world, specializing in air resistance indoor rowing machines. Concept 2 rowing machines are considered the best for strength building and competition training. Assembling this machine is so easy, it takes just about 30 minutes to review the instruction manual and connect the parts. The skeleton is easy to disassemble and store neatly, making it perfect for home use. Caring for your Concept 2 Model D Indoor Rowing Machine is very easy. Start by wiping the monorail with a cloth soaked in soap and water after every use. Do not use any bleach or coarse cleaning materials, as these could cause damage. Check the chain for stiff links and lubricate using mineral or motor oil. If this doesn’t work, replace the chain. Inspect the chain-handle as well. If there are signs of wear, it’s time to replace the entire. Finally, you can use a vacuum cleaner for any accumulated dust inside the flywheel. Keeping your machine in tip-top condition is important for your safety. Any worn-out chain or connector may cause injury. With Concept2, you can connect with their customer support for any concerns or questions. Their prompt and attentive assistance guarantees that all owners get genuine Concept2 parts for replacement needs, and any problem concerning the machine is addressed efficiently. Is It Hard on Your Knees? Concept 2 rower reviews say that the equipment provides a great workout without straining the knees. With the correct rowing form, you can easily adjust the resistance, making the workout right for their fitness level while keeping their knees free from injury. There are a lot of questions regarding these two Concept 2 rowing machines. Since the Model E is more expensive than Model D by $200, what’s the difference? Users say that Model E is easier to maintain, with less upkeep required. For people who don’t have the time to clean and check the parts often, they can opt for Model E. Also, the Model E has a higher seat of 20 inches, compared to the 14-inch seat height of Model D, making it suitable for users who suffer from sore knees and back issues. 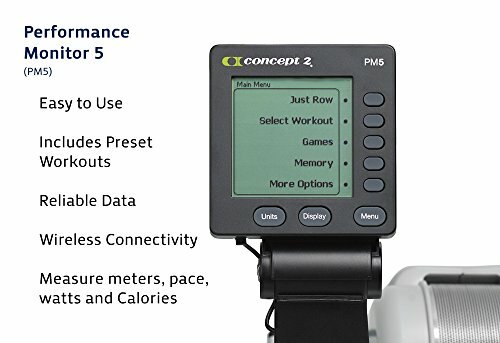 The Concept 2’s PM5 indoor rowing machine has an updated the Performance Monitor. Compared to the PM3, the PM5 is backlit, making it easier to read data. It can be connected to a heart rate monitor for further information on your workout as well. But what we really like about the PM5 is its interactive “race boat” feature that lets you compete with a boat on screen. You can now compete against your previous personal best or go online and challenge other Concept 2 users. It’s such an interactive machine that pushes you to aim higher every time! Concept 2 Model D is the most durable and user-friendly rowing machine on the market today. You can see why this brand has dominated the market—they come up with quality equipment that both serious rowers and beginners can actually train with. The only thing you have to consider is the noise level. The Model D produces minimal sound for an air resistance machine, but it will still make some noise when used. It’s certainly not the cheapest machine, either. But if you’re sure to spend a lot of time rowing for your workout, then you should go for a quality purchase. The Concept 2 Model D will certainly prove to be a worthwhile investment. 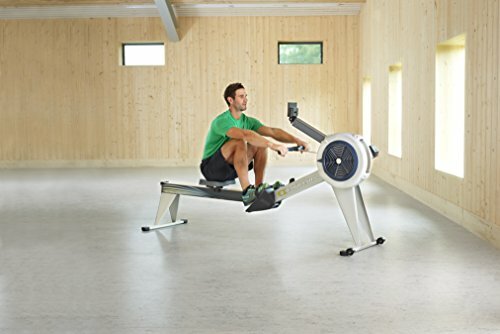 If you’re interested in making indoor rowing a part of your exercise routine, don't hesitate to purchase the Concept 2 Model D. Perfect for both basic- and professional-level training, it is a machine that’s the top pick for gym owners and home users alike because it gives the right amount of cardio and strength training. 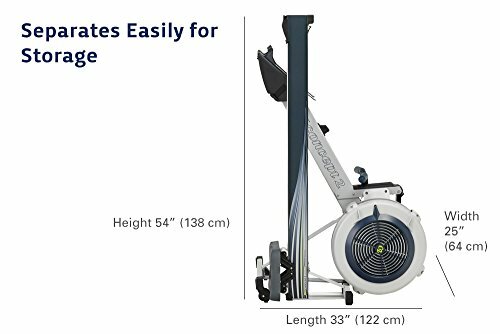 If you have a budget of $1,000, this indoor rowing machine might just be one of your best investments for health and fitness.